On Wednesday April 10th Metro met with planners and staff from the cities of King County to go over progress on the Strategic Plan Update and to better explain the recently released 2012 Service Guidelines Report and its implications. Considering the 17% cut illustration Metro released with the Service Guidelines Report, that part of the agenda understandably dominated the meeting. Metro also announced that starting this fall the publication of its Service Guidelines will move forward half a year. Spring data will be released the following fall. The interplay between these two sets determine whether a route has a High, Medium, or Low potential for a major reduction in service. There is a handy illustration on page 11 (reproduced above) of the Guidelines breaking the charts down. Two points jumped out during the meeting. The first was that the 17% cut scenario presented in Section 5 is only an illustration. It is based off old data (spring 2012), includes only limited restructuring (if such a scenario were to happen there would be more consideration of a county-wide restructure) and it has not gone through any public process. The second was just how massive a cuts scenario this would be. It’s big enough that in the illustration only half of the hours came from the low productivity routes; the other half had to come from medium and high productivity ones. Another way to look at it is that this would cut two thirds as many hours as last fall’s contentious reorganization only moved around (~25%). September 27 2014: Implement Initial 150,000 hour service reductions. An additional 450,000 hours will be cut in 150,000 hour increments in the spring, summer and fall of 2015. Since King County Metro was created due to Seattle Metro being ruled unconstitutional (not sure about the details), would it ever be constitutionally possible to split KCM back up into two separate entities (city and county), as has been suggested in some previous comments? And that would not go very well… It’d be like telling Pierce Transit to do the same thing. Our 17% cut would turn into a 50% cut overnight. There was a Seattle Metro, but I mistook what it was. It was an overarching agency that eventually assumed operation of Seattle Transit (at least according to the Wikipedia article and a grain of salt). But if KCM were to spin off into two separate agencies, one serving and run by Seattle and another serving and run by King County, ignoring the costs of splitting the agency, would Seattle gain much in the way of keeping transit revenue from current tax levels in the city or would it be a wash or a loss? History link has a good explaination, Metro: Municipality of Metropolitan Seattle. Note that “Metropolitan Seattle” was used distinguish the metro area as opposed to the city limits. Metro had been expanded to include the entirety of King County by the time it assumed control over the Seattle Transit System. The private operations it replaced on the eastside amounted to I believe nothing more than a single bus operating between Bellevue and Redmond. There are several policy reasons listed at page 15 of the above link for Metro to implement a cash surcharge. If we make it easy to get free ORCA cards, the downsides of a cash surcharge are minimal. I don’t know that you could get 100,000+ hours out of reducing cash payments, but you could definitely get a few, and it would improve service quality as well. We should impose it within a month or two of easy free ORCA availability. A common theme we should be emphasizing is that, until you reach the point where you have to cut trips, saving hours and improving service quality almost always go hand in glove. 2 – make the price 5.0p, credited to the pass (2 peak fare rides) by default. Seems to me that mandating ORCA would drive away occasional riders. I’ve never owned an ORCA card and have no idea how to get one. I’m sure I could find out but why bother? I’d rather just pay cash. I’m also happier knowing that I’m not leaving a digital trail that way. Okay, that’s fine. You should get a financial penalty for slowing everyone else down. BTW, you shouldn’t benefit from a more relaxed paper transfer system either. If you go to a TVM and buy an ORCA card with cash, never register the card and only refill the epurse with cash, you effectively have an anonymous ORCA account. ‘They’ can find out about linked trips, but they won’t know you. I’m sure I could find out but why bother? So that you don’t hold up the other 40 people on your bus. If you do want to hold them up, it’s only fair to pay a penalty. A reader of the Seattle Transit Blog has no idea how to get an ORCA pass? Mars–you haven’t been paying attention. Mars is not the first to imagine a movement to ban cash. Metro played into this fear when they starting talking about “going cashless”, which was really a reference to deploying bus ticket vending machines all over downtown, Sidney style. I don’t think an extra 25 cents for cash fares will drive away an appreciable number of riders. But I do think those occasional riders will ride more often once they notice how much faster the trip is. Right now I pay a 25 cent penalty for using my ORCA card in the afternoon. It works like this. I board the 255 at 5:07 but since the route started before 5PM I only get charged $2.25 for a one zone fare. Then when I transfer to the 249 it rings up a 25 cent Xfer fee which would be free with cash and a paper transfer. Then there’s the whole issue of paper transfer typically being issued for way more time than you get automatically with an ORCA card. And you get to pay $5 up front to open a new interest free savings account with ePurse. Heaven forbid your card quits working or gets lost/stolen. There is still a large incentive to pay cash. Bernie – As long as you don’t let the driver of the 249 get a real good look at the transfer. If they notice it’s not punched for peak, they could ask for the extra quarter. Oh, sure – I thought there was a proposal to stop accepting cash on the buses, but if all we’re talking about is a different price for ORCA users, that’s fine. If people want to spend the energy figuring out the ORCA system, let ’em get a discount, sure. Just as long as I can still grab some quarters and head out the door and take a ride, and not have to deal with forms and accounts and paperwork and another goddamn card in my wallet. I think I did have an ORCA card once, actually, but it was just my security badge from work, and I have no idea how it was set up. So you’re right, Emily, I haven’t been paying attention – I haven’t had to! I don’t ride the bus often enough to care. I’ve started following the Seattle Transit Blog because the light rail system is finally starting to look like it is eventually going to become a real rapid transit network, and I’m hoping that this blog will inform me about opportunities to lobby officials or show up at meetings or otherwise exert some kind of pressure to help get more track built sooner. peak is from 6 am to 9 am and than again from 3 pm to 6 pm, generally speaking. Each trip is designated peak or off peak depending on its characteristics. if the 255 trip you boarded was coded off peak but you board a 249 trip that’s coded peak you will pay 2.25 initially for the 255 and then 0.25 for the 249.
i have noticed that if you take the 101 102 106 or 150 south the orca preset is for one zone peak even though many or most riders continue to renton or Kent (106 also Seattle which legitimately would be one zone). interesting. I’m starting to wonder if the size of this potential change is large enough that instead of talking about cuts/reductions to existing service we should be thinking about rebooting the whole network. Start with a blank sheet of paper and map out the most “useful”* network you can with the anticipated budget. You can then define additions/subtractions to this network as the budget changes (e.g. “here’s what the +10% network would be”). That way you have transparency when asking for additional funding (from whatever source) and clear ramifications for what happens if the budget isn’t as high as you expect. I’d even go so far as to totally redo the route numbering so there’s a clear signal that this is something new and a radical change from the status quo. * – “Useful” can be defined in a way that takes things like social justice, etc. into account and you can certainly leverage data from existing corridors when making this new network, but we should define a network that is most useful for the entire region without being beholden to history (or particular vocal constituencies). It would be good to have an unofficial alternative or two showing the best kind of service we could have with the reduced hours. That would be like Seattle Subway’s concept map, giving people a concrete vision of what’s possible. We can start with the frequent route 13, 5, 3, 11, and 80 ideas that were scuttled last year or never reached an official proposal. As a paper exercise we can just whack off the 25 and 27 and 61 and tell people to walk or drive, and assume that the opposition will be dealt with at a later stage. I’d like to see David L’s excellent proposals pieced together into subarea-wide plans. It would be worth showing what a system with absolute priority on frequent corridors would look like, reserving only a minor percentage (say 25%) for coverage service in the gaps. Then, where a package of expansion hours would go to improve the system. Another approach, and one that would have more immediate clout, would be to reorganize Seattle’s buses to match the Transit Master Plan corridors. That map already has political approval, so it has a better chance of being enacted. But we also need to be concerned about assuming the cuts will happen because that can become a self-fulfilling prophecy. Reorganizing routes can lead to improving some corridors, but it’s probably not enough to finish the job or to avoid degrading service in some areas. And it’s very unlikely that our ideal map would be enacted in a cut scenario. Even if Metro goes forward with a “system-wide reorganization”, I dread that it would only go halfway and the status-quo advocates would succeed in keeping buses on most of the current streets, leading to the half-hourly-or-worse service we currently have that saps ridership enthusiasm. 1) Don’t leave riders behind at bus stops on a regular basis. 2) Prioritize service that is productive in terms of passenger trips per platform hour (a metric Metro uses) and average in-service load (a metric it doesn’t use to measure productivity). Disregard metrics involving passenger miles, which have an inherent bias toward outer areas. 3) Prioritize speed and reliability when making routing choices. In addition to making service vastly more useful, this increases bang for the service hour. 4) Avoid duplication and unnecessary complexity. The TMP idea is growing on me. What would Metro look like if we started from zero, then implemented all RapidRide corridors and TMP corridors to RapidRide’s standard (15 minutes until 10pm every day), and substitute routes for the unfinished part of ST2 Link. Would there be enough hours to achive the RapidRide standard? How much would be left over to add service in the gaps? Would there be enough hours for some kind of service on (for instance) 8th NW, Latona, and the 355? I think the chance of a 100% restructuring of service is exactly zero. I also think the result would look more like a simplified version of the current network than a lot of people expect — the forces guiding its evolution, while sometimes goofy, are usually understandable. But I also think it’s enormously valuable for those who are knowledgeable about the system to put together proposals, both to try to put the messages that the numbers are sending into concrete form, and to give the public (and planners, to the extent they’re not already doing similar but superior work) a vision of what a rational network might look like and of some of the benefits it might bring. 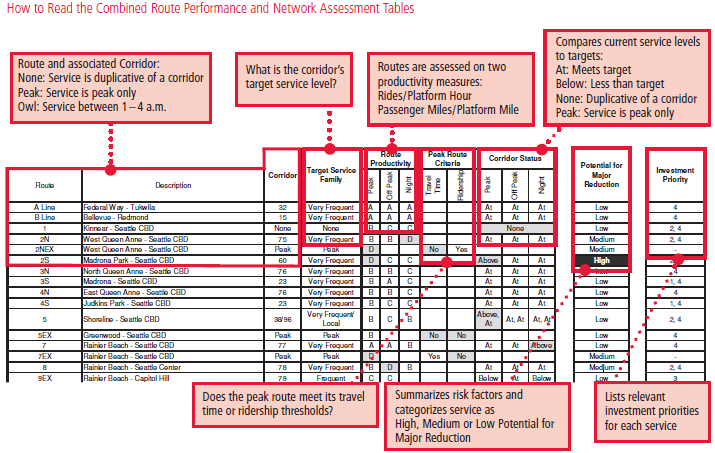 My back-of-the-envelope work, which is certainly affected by a lot of assumptions, suggests that by making some tough choices on one-seat rides, deviations, and duplicate corridors we could get to RR or better frequency on most of our critical corridors and to 15-minute daytime frequency on all the high-ridership ones. If the voting public truly understood that it could be a game changer. I think many of the proposals for last fall’s (largely failed) restructure fit squarely within what you describe in your last paragraph. However, while a lot of the opposition to those changes were from folks who wanted to maintain the status quo at any cost or were NIMBYs (Not If My Bus is Yanked), I also don’t think Metro did a good job of communicating the net benefit of those proposed changes. The current transfer experience is fairly miserable for many folks (as has been discussed here recently), so I can understand why folks would not be willing to give up their one seat rides with only Metro’s assurance of “it’ll be better”. They needed a clear, compelling story, that, while it might not assuage the folks who weren’t going to accept *any* change, would be accepted to folks willing to look at the proposal rationally and within the context of the current funding landscape. A “reboot”? Keep in mind, the #5 has changed little since the interurban day, and the recent “patch” that involved the introduction of Rapid Ride and other changes practically had riders running for torches and pitchforks. Like I said, it’ll never actually happen, but there’s still a lot of value in thinking about it and gaming it out. Us transit geeks learn a lot from it, and I guarantee the planners are doing it too, and it’s driving their restructure ideas. Quite a bit surprised to see the 177 marked as “low productivity”, that bus pretty much has it’s very own park and ride. Not surprised to see the 179 listed as at risk, though. The route of the 179 north of FWTC is *identical* to ST 577/578. Oh, and it costs 50 cents more. Seriously, how can they talk about transit efficiency and not have noticed this? I don’t see the 178 listed, so I’m guessing they lump it in with the 177? As for the 177, MT/ST could save a lot of trouble — and reduce a lot of overflow parking in downtown FW — if they just had all their FW buses serve *both* the FWTC *and* the S 320th P&R. It doesn’t make a lot of sense IMHO to have two transit parking lots within a block and a half of each other and send no bus (outside the also-doomed 901 DART) to both. Redondo Heights and Star Lake, I’m watching you two also! Heck, Redondo Heights probably sees more traffic from driving practice than it does from bus riders. Unidirectional routes as long as the 177 (and 178/179/197) have quite a challenge in meeting the riders-per-hour productivity metric. The 178’s not on the list because it’s a new route. Look at the numbers for the old 196 and you’ll see why they canned it in favor of the 178. Having most of the FW buses not serve the S 320th P&R is the way that Metro *finally* solved the horrendous security problems at that facility. It was never designed to be easy to police, and was one of the most dangerous places in the system for the entire time the 174 stopped there. The TC is a huge improvement in that respect. So the transit systems need to find a way to increase car capacity, and adding both stops to lines that stop at either would probably help. Despite the convenience of the similarly-aligned 577, the 177 is still a popular commuter route. Or start charging for parking to manage demand. @David L: If the problem is ridership (and it seems to be, if the 177 is considered for cuts), the only reasonable way to get to the bus stop is driving there, and the lots are full, then in the short term KCM would indeed have to add parking to increase ridership. In this way it’s in the same situation as every suburban business. The wages of sparseness is cars. If the 177 is unproductive despite the P&R it serves being full, then that’s an unsustainable situation. Adding more car capacity would be a very expensive and environmentally retrograde way to fix it. Cheaper ways to fix it could include combining the 177 with other P&R routes (as was already done with the unproductive 196); combining it with neighborhood service like the 179; or simply reducing the number of trips. And if the P&R is full then demand-management charges are justified regardless of whether the bus service is productive or not. These ideas of paying a penalty for “slowing the ride down” by paying cash are silliness. When bicyclists (I’m one) board with a bike, we slow it down. Those with disabilities slow the ride down. People who are on their cell phone chatting while they search through their bag for their Orca card slow it down. Old people are slow- let’s charge them too. Instead of punishing riders with cash, welcome them, but make sure that riders with Orca cards pay less. Provide incentive to buy an Orca card, not a disincentive to use cash. Provide incentive to buy an Orca card, not a disincentive to use cash. But this is exactly the same thing? A “Orca discount” is equal to a “cash penalty”, it’s just how you frame it.